DVDFab DVD Copy is a stable, powerful, easy-to-use DVD Copier/Burner/Decrypter which can copy any DVD (protected or unprotected) to any blank disc or hard drive with a very fast speed and wonderful quality. 8 copy modes are available: Full Disc, Main Movie, Split, Merge, Customize, Customize Split, Clone, and Write Data. It can copy DVD-9 to DVD-9, DVD-5 to DVD-5, DVD-9 to DVD-5, DVD-5 to DVD-9 with amazing effect. 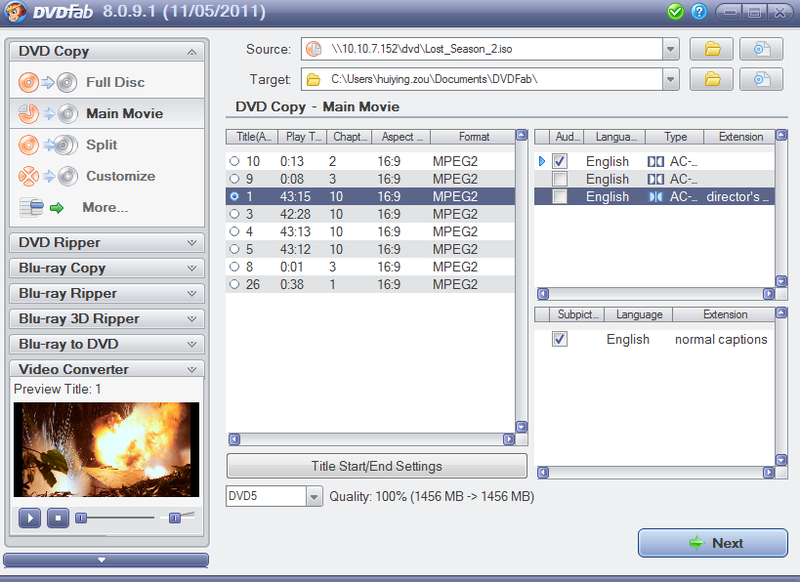 WinCopyDVD is a dvd ripper and dvd copy software. CD and DVD and now Blu-ray backup software and burning software! Copy DVD to hard disk keeping all the original DVD features with Dvd95Copy Lite! RZ DVD COPY, Best Solution of DVD copy, copy any home dvd, constantly update! Fast and easy-to-use software which can copy a DVD movie on one disc. Copy DVD disc and burn to blank media quickly with Dvd95Copy XPress! DVD XCopy Deluxe - Copy your DVD movies without losing quality!! Qweas is providing links to DVDFab DVD Copy 8.0.7.3 as a courtesy, and makes no representations regarding DVDFab DVD Copy or any other applications or any information related thereto. Any questions, complaints or claims regarding this application DVDFab DVD Copy 8.0.7.3 must be directed to the appropriate software vendor. You may click the publisher link of DVDFab DVD Copy on the top of this page to get more details about the vendor.